Vintage clothing in MTSU’s His..
An MTSU alumnus who maintains a thriving career in Washington, D.C., took time recently to share his experience with students at his alma mater. Jim Free, co-founder of The Smith-Free Group LLC, spent a busy two days talking to about 230 students in political science, recording industry and history classes on Sept. 26 and 27. He is serving as a Distinguished Visiting Professor for the 2018-19 academic year. In professor Kent Syler’s American Government and Politics class, the former special assistant to the president for congressional affairs under President Jimmy Carter expressed his pride in working with members of Congress for passage of the Clean Air Act, the Alaska Lands Act, national energy legislation and intellectual property protection. While admitting that the atmosphere on Capitol Hill was different from today’s divisive partisanship, Free said he blames the change on the way computers have been used to gerrymander Congressional districts. He said the way districts have been redrawn has the effect of minimizing the impact of independent and undecided voters. 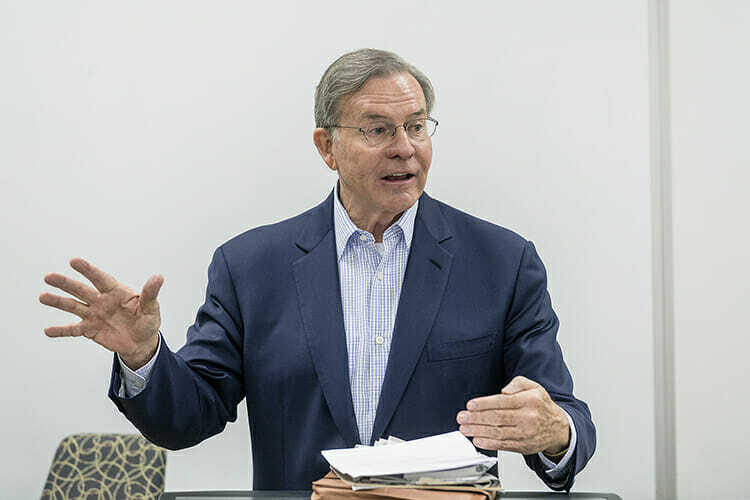 Syler, a former congressional chief of staff and current political analyst for WSMV-TV, said he’s pleased his students will be able to hear a wealth of political knowledge directly from someone as experienced as Free. When asked about the outlook for the millennial generation amidst the social and political friction of the day, Free expressed a firm belief in the system of checks and balances established by the Founding Fathers. Free served as MTSU student body president in 1968 and earned his bachelor’s degree in political science in 1969 and his master’s degree in public administration in 1972, both from MTSU. A former administrative assistant to then-Tennessee House of Representatives Speaker Ned McWherter, Free ascended to chief clerk of the House and became president of the American Society of House Chief Clerks and Senate Secretaries. Before co-founding The Smith-Free Group in 1995, Free served as vice chairman of Walker-Free Associates. With both groups, he represented major global companies in the arenas of health care, financial services, transportation, energy and entertainment over a span of three decades. Free returned to campus last fall to serve as a guest speaker for three of Syler’s political science courses in the Department of Political Science and International Relations as well as a history class taught by Dr. Louis Kyriakoudes, director of MTSU’s Albert Gore Research Center. For more information about the visiting professorship, contact Syler at 615-898-5625 or kent.syler@mtsu.edu.